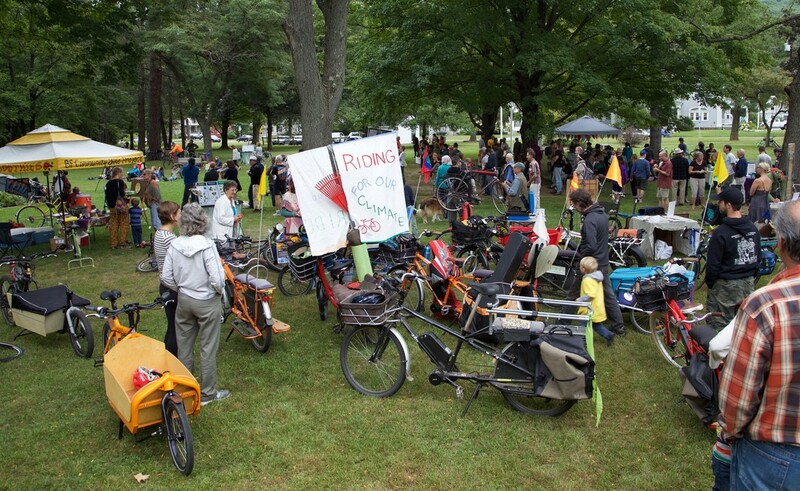 What happens when Brattleboro area activist bike riders come to show off the amazing bike revolution emerging in town? It's a zoo. Well, a Bike Petting Zoo. Many of you have seen the stunning pictures from the Rise for Climate ride (see iconic pic below) that we had on Saturday, September 8th for an international day of action around climate change and organized worldwide by 350.org. 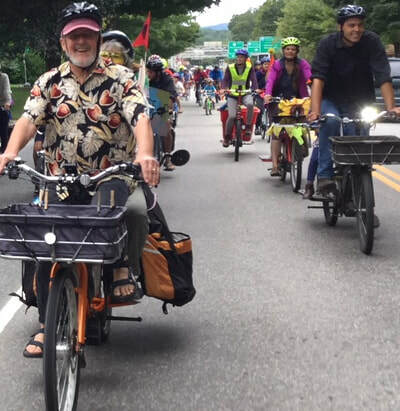 In their perfect wisdom, Brattleboro's 350 node group decided to mark this day with a Critical Mass type bike ride, along with a march and a well-organized and all-around positive rally at the Brattleboro Common. Our ride had over 100 cyclists, including all sorts of electric cargo bikes, ebikes and bikes of all types. And at least 20 kids joined in the great fun and important message we're propelling! There was some 250 in total at the rally. 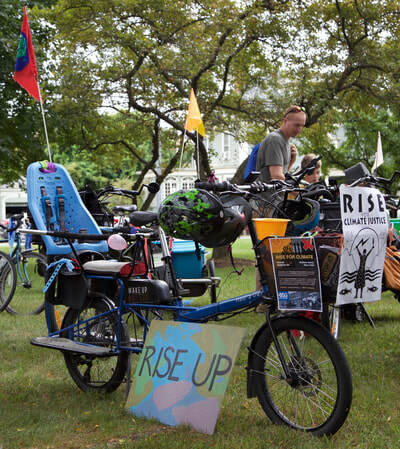 But what we'd like to tell you about here is VBike's Bicycle Petting Zoo at the Rise for Climate rally. It was a mind-blowing collection of bikes showcased by their owners. There were were cargo bikes from Madsen, Yuba, Xtracycle, Bike Friday, Juiced Bikes, and Larry vs. Harry. 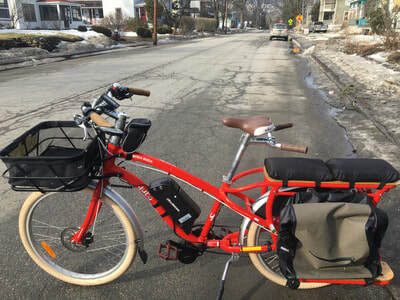 And then there was a bunch of bikes that were converted into e-bikes at Brattleboro's local shops and quite a number of purpose built ebikes. 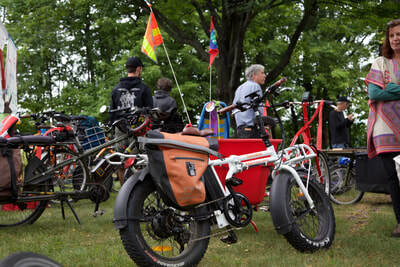 Things were topped off by the VBike fleet of cargo bikes, including our new Argo super cargo bike attachment. Check out some of what we had at the Bike Petting Zoo. We will certainly do this again! 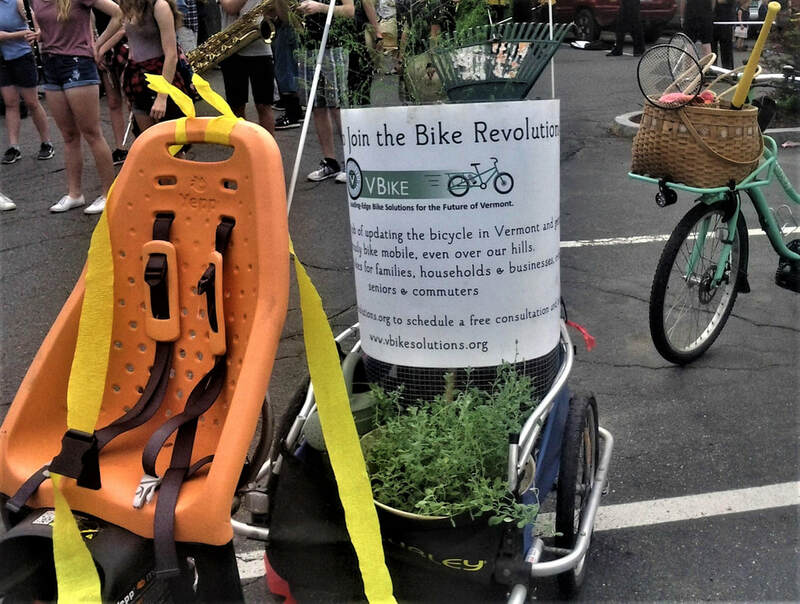 Folks got a good taste of this emerging bike revolution in Vermont and how that connects with issues of climate change and making our communities just so much better. And thanks to 350 Brattleboro for organizing this wonderful day of action. 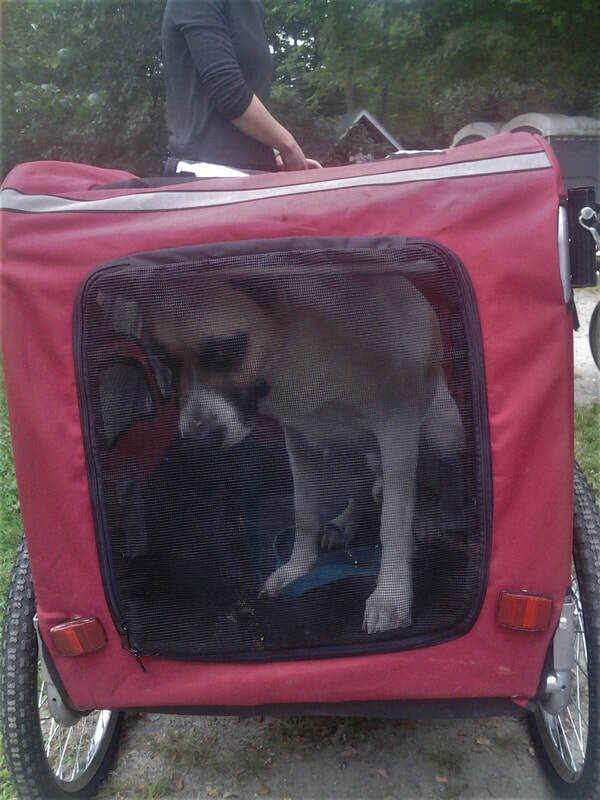 Dog's love to ride, too. And check out how the day went on our Facebook posts and these articles in the Commons and Reformer. Wait to you see what comes next! 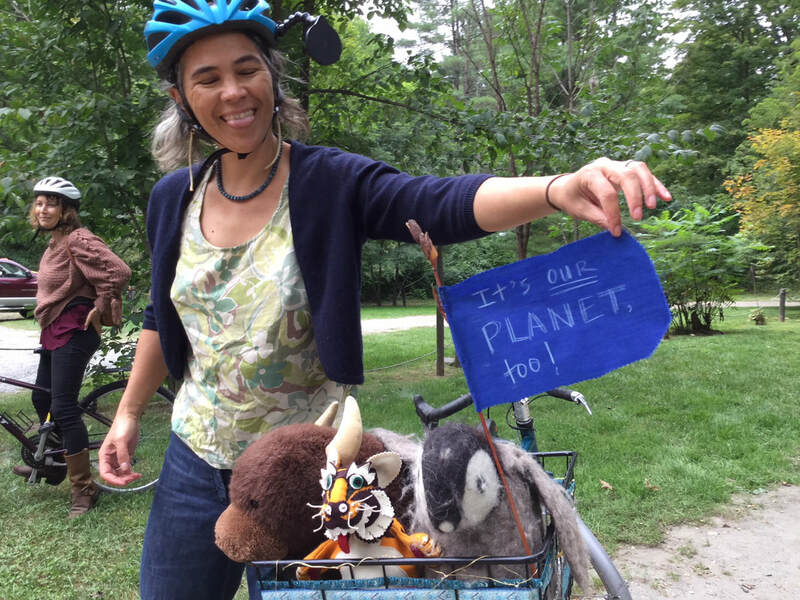 Wendy Levy leading the pack on Flat St. 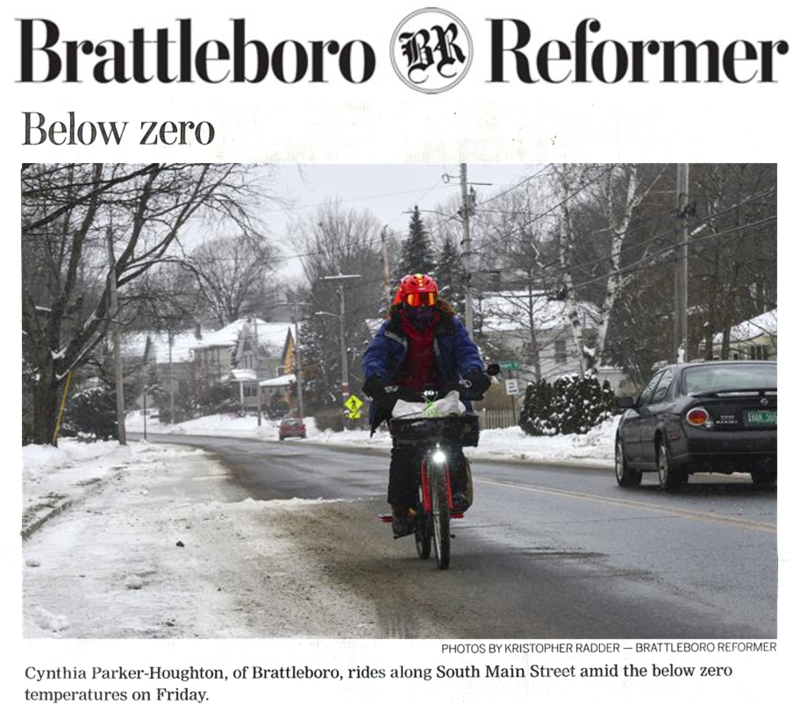 This is what rush hour in Brattleboro will look like in 5 years! 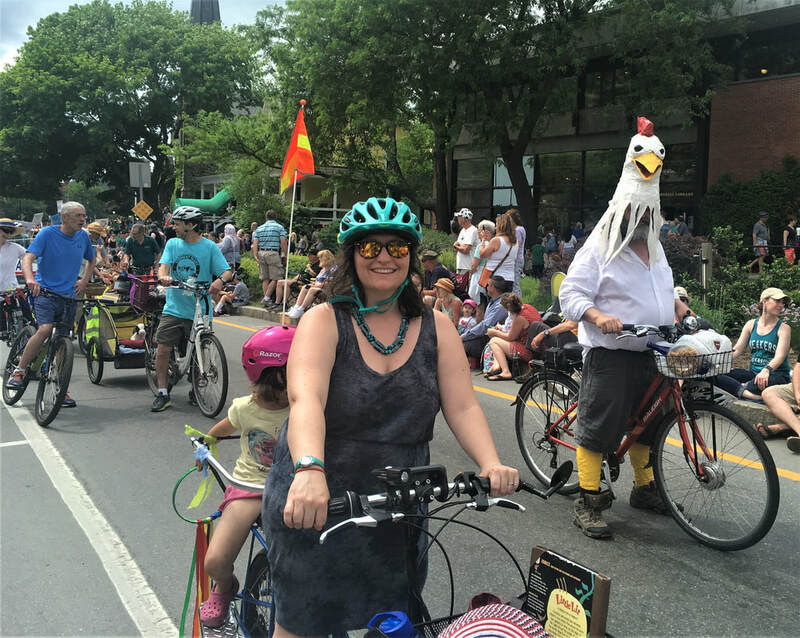 A great crew of VBike supporters gathered to ride in the Strolling of the Heifer parade on Saturday, June 2nd. We totally showed solid bike diversity - electric longtail and midtail cargo bikes, a solar-electric cargo bike, e-bikes, converted e-bikes, an e-bakfiets (made by Fhar Miess), folding bikes, bike trailers (one carrying hay), a chicken biker (see below), a bunch of great kids on bikes with their parents and more. 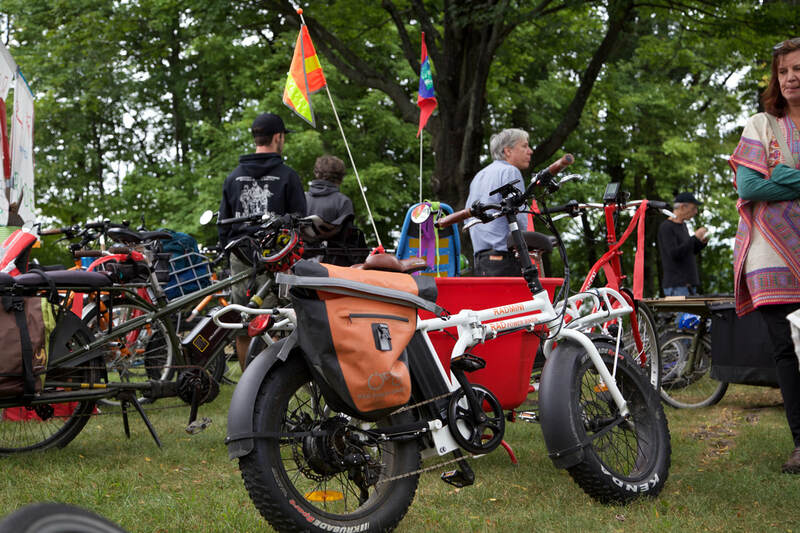 That's Dave Cohen on VBike's extraordinary electric Yuba Mundo with a powerful e-assist. This bike can go anywhere at any time with its 1000 lumen front light. Behind is Fhar Miess' unique and handmade (by him) electric bakfiets. 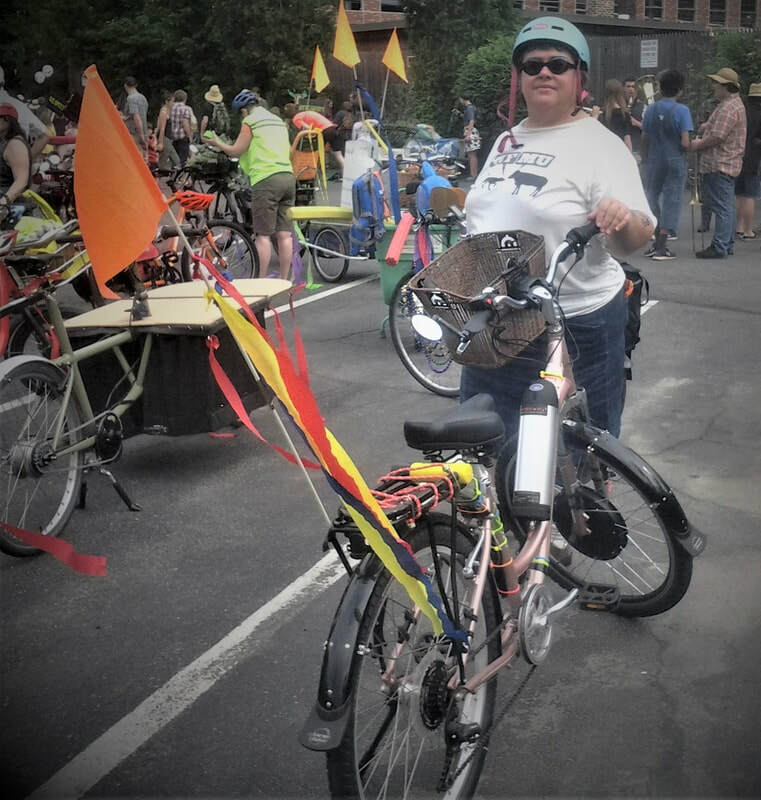 You can't imagine how many folks still talk about the time we showed up at the Stroll in 2014 with a bunch of great bikes. 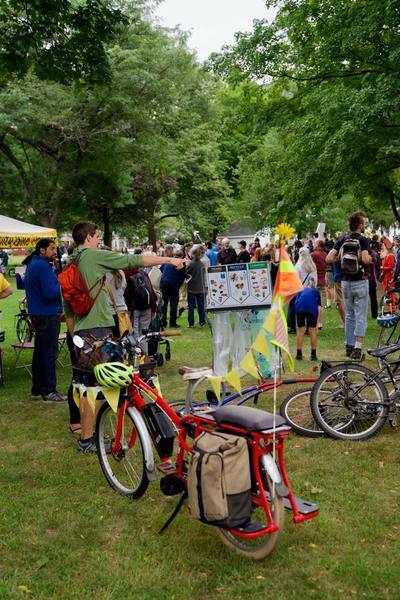 After Saturday's showing we've already received numerous emails and phone calls from Brattleboro residents wanting to shift up to the bike and get a free bike consultation from us. It's all about car-reduction therapy! 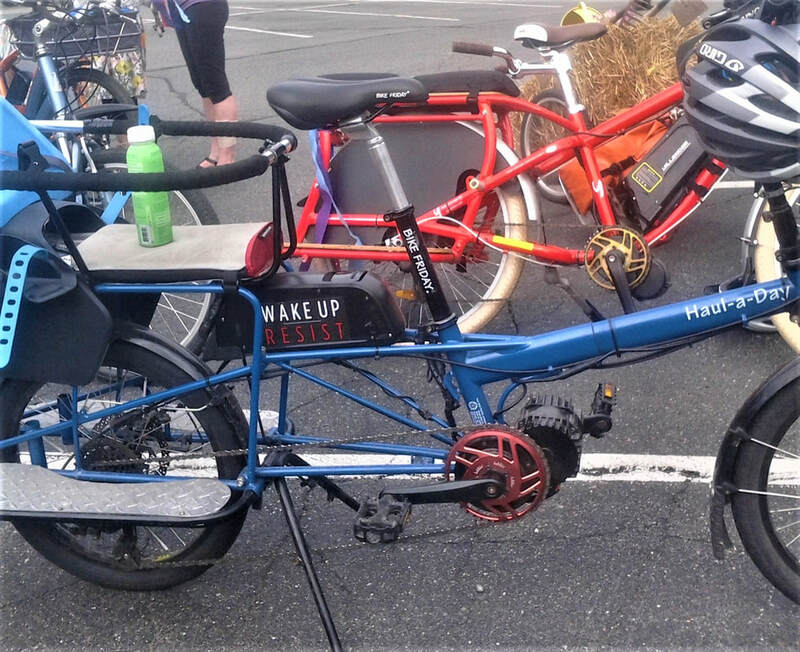 Nothing like an e-cargo bike with a potent message! Actually, riding a great e-cargo bike like this is irresistible. 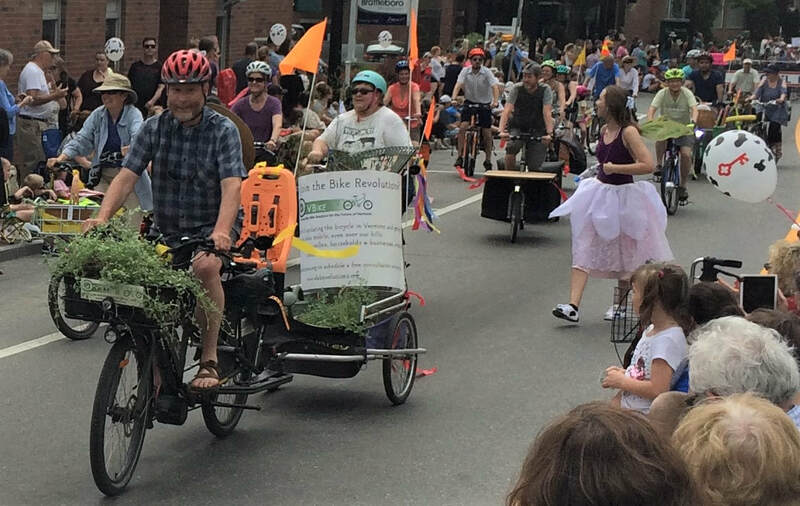 Quite a number of the Brattleboro area cargo and e-bike people had other competing commitments in the parade (marching with their kids' schools or some other org) and numerous bike inspired folks were out of town, but our showing was more than enough to get folks excited and thinking. 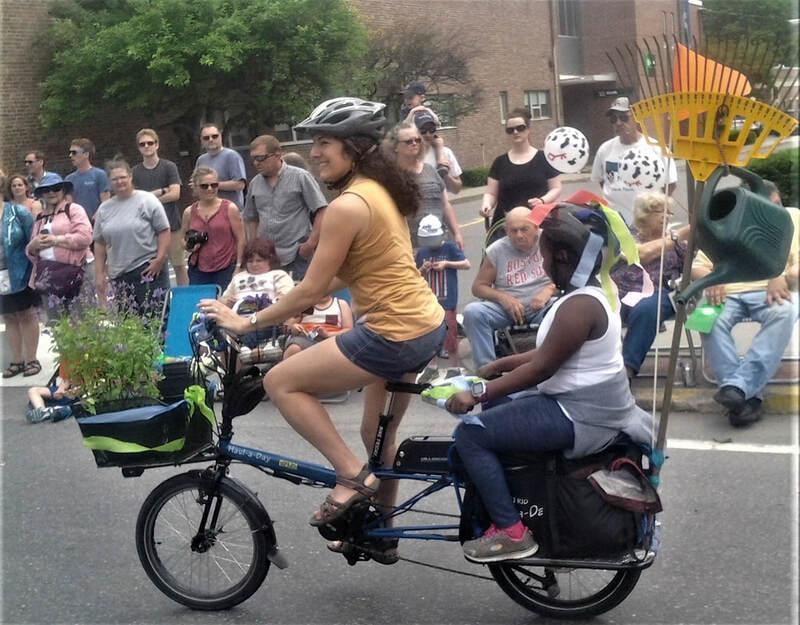 We could have added at least another 15 or so e-cargo bikes and 50 some odd e-bikes (that would have violated the parade rules), but just take a look at these photos to get a sense of the fun and excitement we generated. 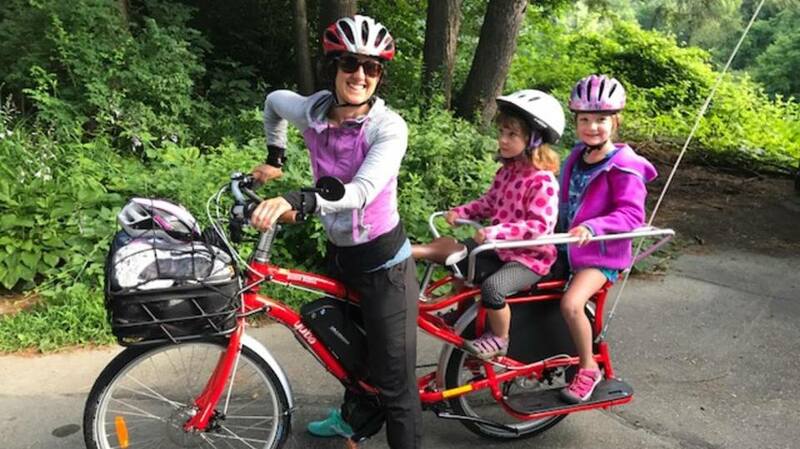 Sabrina Daigh Smith and Alaya on a VBike Yuba Boda Boda. Fahr Miess' e-bakfiets cargo bike is in the background. More of Rachel, Cody and part of the VBike gang. Katie and Jubilee riding their e-cargo bike while Rolf "The Bike Chicken" with a Hilltopper e-assist kit eggs her on. Sheila on her e-Mundo & Eddie on an e-Madsen look on. Wendy Levy's nicely converted e-bike. She's proud! 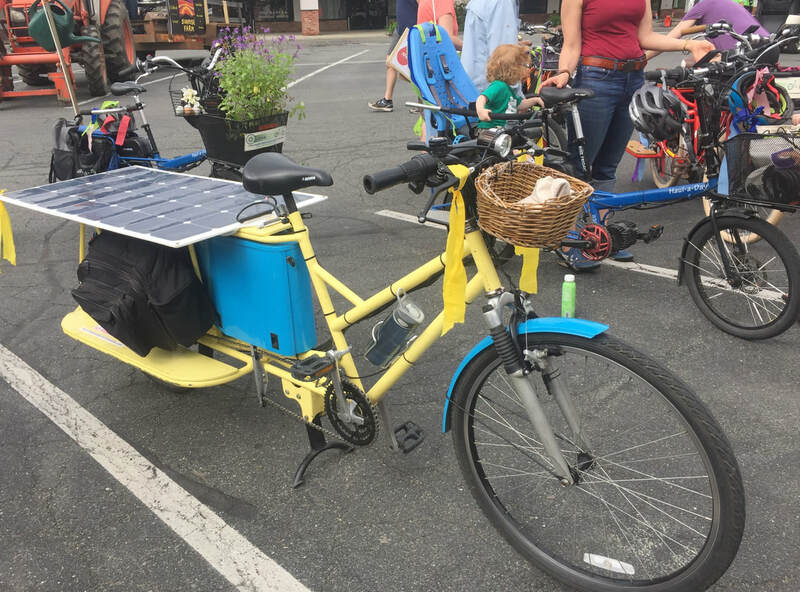 Karl Kemnitzer's amazing solar-electric cargo bike. The dude climbed Mt Washington on this yellow dream. 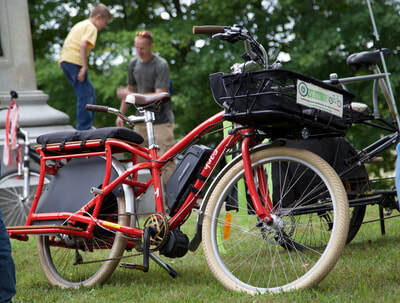 This trailer was attached to VBike's electric Yuba Mundo with a 1000 watt mid-drive e-assist. That's our banner. That's the wrap up. We'd love to hear from you and for you to join this emerging mobility revolution that touches upon so many of the things we all want to see in the world. You know this is the future (the good one). And most of you already know our rap, so let's hear yours and stay tuned!! Four years later folks are still asking about that mass of cyclists, remembering what fun it was to see such a large and diverse contingent of bikes, cargo bikes, e-bikes and other human-powered vehicles. We've been approached a number of times about when we might show once more. It definitely was an absolute blast and so the time has come for us to do this again! Come join us for the parade on Saturday, June 2nd at 8:30 (details on the staging area will be available later). The big difference is that we now have so many more families, households and individuals taking to the streets and bringing this human-scale type of mobility to our community. There are at least 120 residents in the Brattleboro area that have some sort of e-bike, including some 23 electric cargo bikes. VBike wants to grow this even faster and the Heifer parade is an excellent way to show the community what is happening. 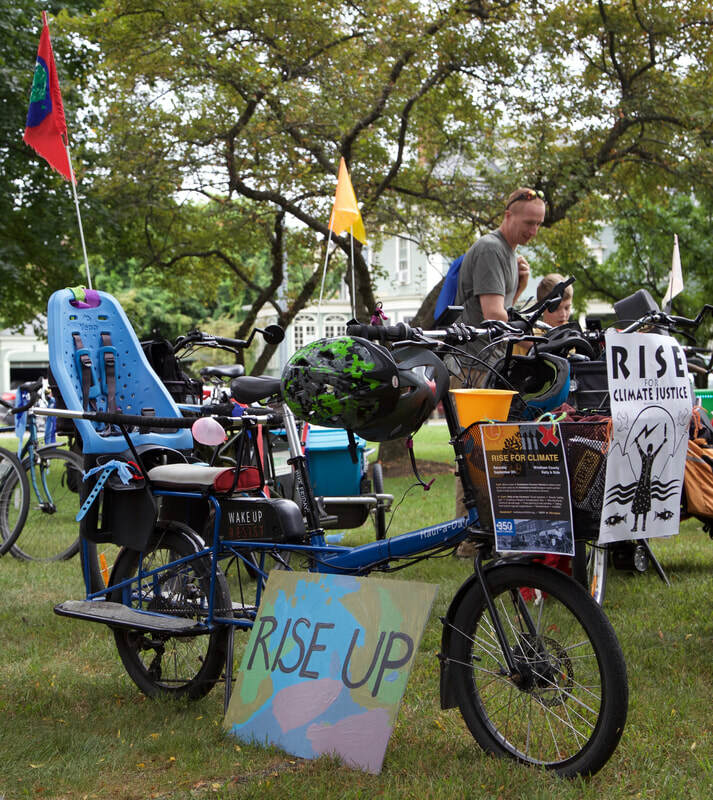 This is also a great way for us to connect as a growing community of folks that are the pioneers in what is emerging as a revolutionary mobility movement. 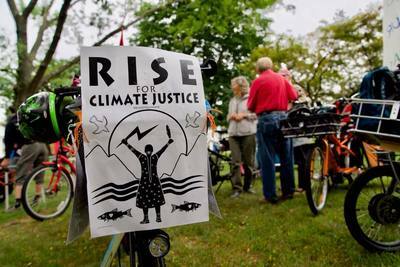 Whether it is for the exercise, concerns around climate change, resisting being colonized by the power matrix of car or fossil fuel corporations, wanting to make our communities more livable, your sanity or some, all or other reasons, this is a an absolutely superb gathering to come join. Let us know at info@vbikesolutions.org if you are planning to join us. The parade is on Saturday, June 2nd & we'll meet at around 9 am. The parade starts at 10 am. The theme this year is May the Farms Be With You, so if you can dress the part, whatever that might mean, go for it! 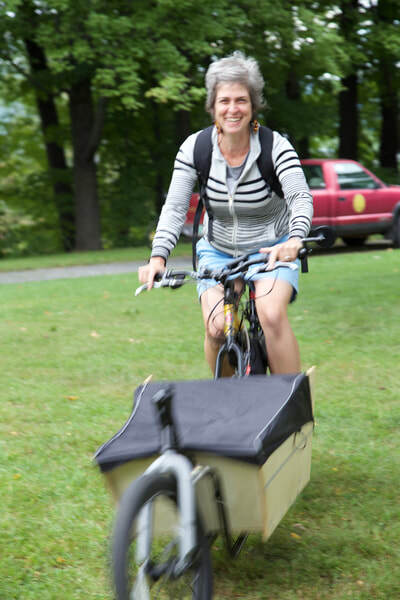 Listen to Brattleboro's Laura Goldblatt talking about her Madsen cargo bike outfitted with a 1000 watt Bafang BBSHD mid-drive motor. She covers everything about her bike, the experience of riding, lights, vestibular stimulation (wow!) and how drivers respond to her. VBike helped Laura's family find the right cargo bike for their needs and consulted with them on outfitting it with an e-assist kit would work well with the Madsen. It was a blast working with them and now it's just pure joy watching them out is the real world. You know, the world we actually live in! 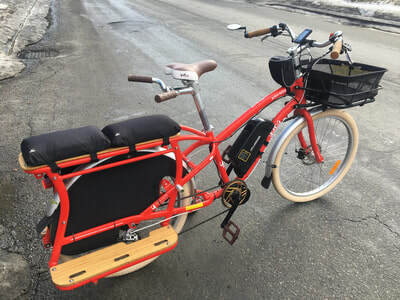 ​Last month, VBike received an email from a guy announcing that he was in the process of designing and building a cargo bike made out of local wood. We just have to say that most folks that tell us something like this our reaction is a sort of "wait and see." We try not to pass judgement, but we’ve heard plenty of things that just haven’t come to fruition, or even remotely close. 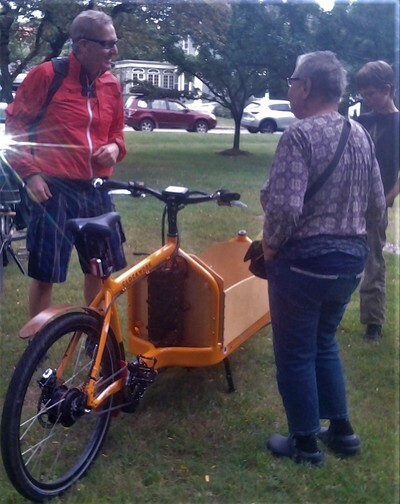 How about an electric bike that can haul 500 lbs and made out of discarded pistachio shells. Seriously folks. However this is different - this is Ward Ogden. Ward is a master woodworker and carpenter and has put his enthusiasm and mind to the idea of wood and bicycles. To date he has to his credit a badass gravel grinding bike he made out of, yes, wood. Just check this out. This bike rocks, if that could be said of a bike frame mostly made from tree-based material. The thing we especially like about Ward is that he has a nicely balanced and refreshing vision of bikes. He believes that bicycles can not only be great fun, but that they can also be profoundly useful, serious, yet joyful transportation. And so it's time for us to move beyond the bike as only recreational and start looking at replacing as many car trips as possible. Being in the world, engaging our bodies and connecting with the terrain is so much more "Vermont" than confining ourselves as well as our experience of our great state and our blessed communities inside an automobile. That’s the message that VBike has been working to bring to Vermont in introducing new bike designs and technologies to our state. We're changing the landscape of the bike! 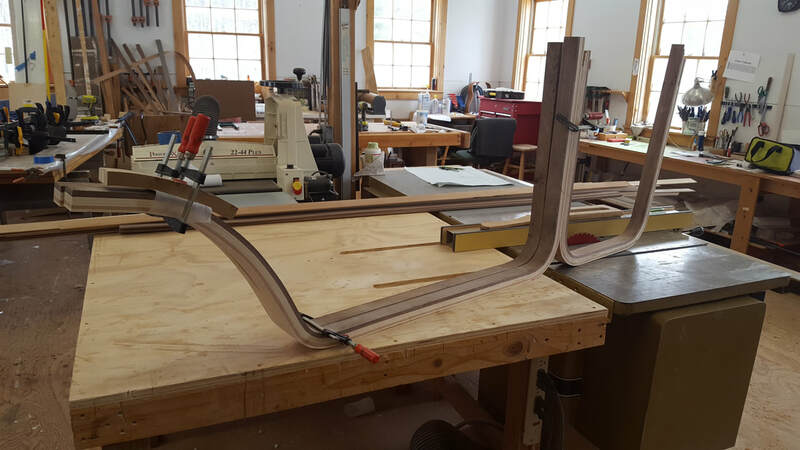 So, Ward is now not only designing a cargo bike with a frame mostly composed of wood, but he is going to electrify it. 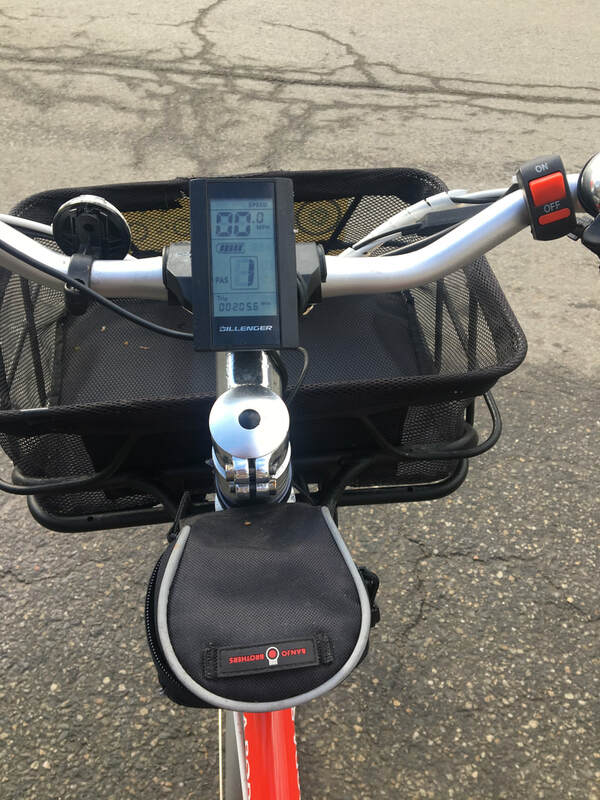 Where he lives in Putney there's a bit of climbing to do to get home from jobs or errands downtown, so Dave Cohen at VBike had the pleasure to sit down with him to discuss e-assist options for the bike. We have to tell you, Ward is on fire about the whole process of designing and making this, but he is not just thinking about this one prototype. He is eyeing the idea that he may even develop this into a small business. With the fast growing popularity of electric cargo bikes on the market, Ward believes he might find a niche here. 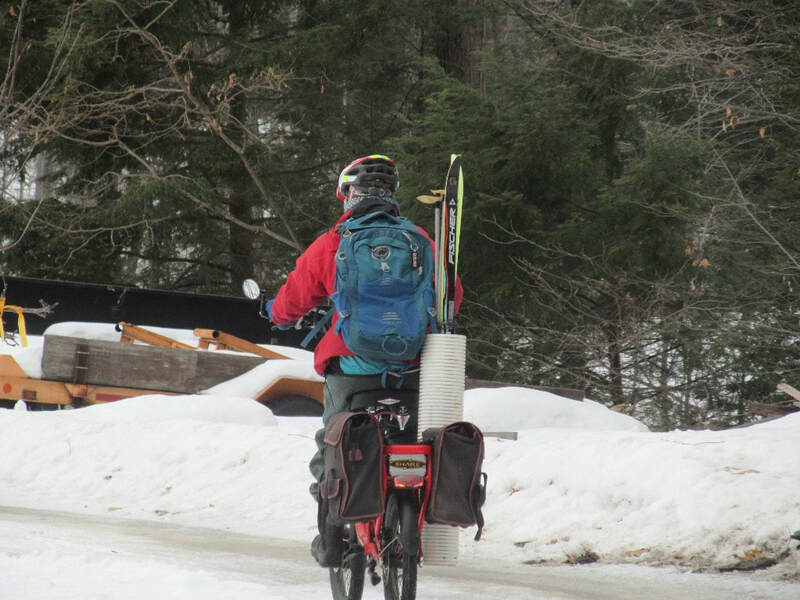 This is the sort of thing that we at VBike love to see grow in Vermont. However, from here on we'll leave it to Ward to describe some pics he sent to us. Some of what follows is a bit technical, but we thought you might like to hear from him in his own words. ​We can’t wait to see how this will turn out! 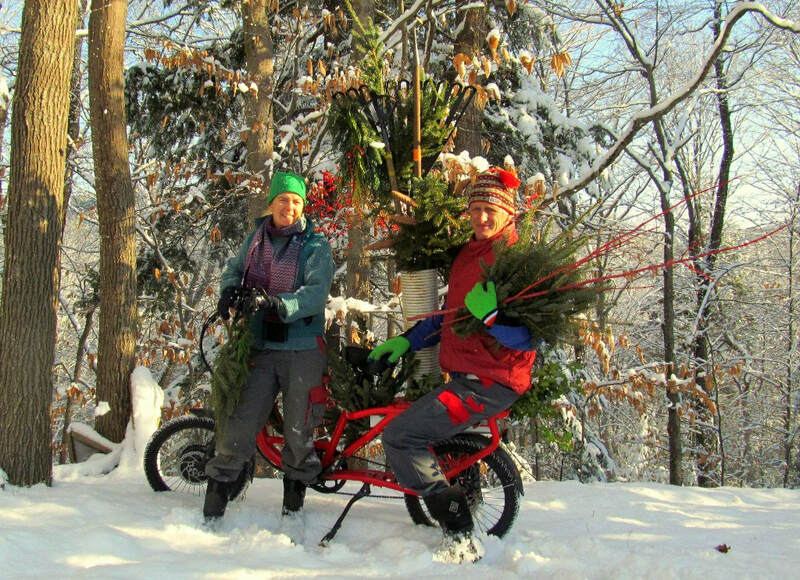 Evidently, Winter isn't over because this weekend I started designing a wood e-assist cargo bike for Maria and I. 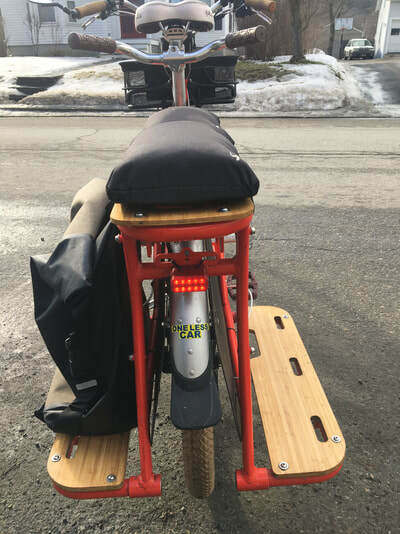 The idea is to do more of our errands fossil fuel free, and since our PV panels generate WAY more power than we use, an electric Bakfiet style cargo bike looks like the ticket. We have 3 miles of climbing getting back to our house, with an average grade of 5.5%, and the last half mile being closer to 8%, so e-assist will be necessary. The frame will (may?) be constructed out of four main bent wood structures, plus seat and chain stays. For a motor drive, a Bafang BBSHD looks like the affordable option, and I'll need to build the 52v, 20ah battery myself from individual 3500 mah cells. Of course as I learn more, this may all change! 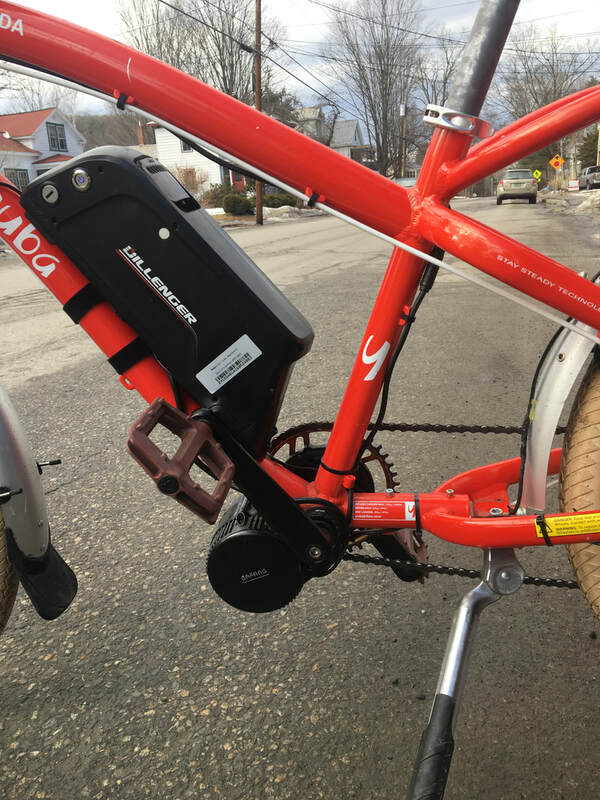 In other news, I have decided on the electric drive unit, Bafang BBSHD mid-drive that has pedal assist. It will require a bit of fussing in the BB area, since there are clearance issues, but it shouldn't be too hard to adapt and offers all the power and features I am looking for. This morning I pulled half of the bakfiet frame out of the form with all three main components epoxied together. I have had concerns about how vertically rigid the frame would be, so wanted to conduct a VERY rudimentary static test. I placed the frame on two 44mm tall blocks, clamped one end to keep it from tipping over and then proceeded to place 320 pounds of tractor suitcase weights on it. I was stoked to see that there was virtually zero deflection. I am sure that a micrometer would have picked up plenty, but for my purposes, the number is zero. The moment arms at both ends will be greater once the chain and seat stays, along with the forks come into play, but this gives me confidence it will be strong enough. 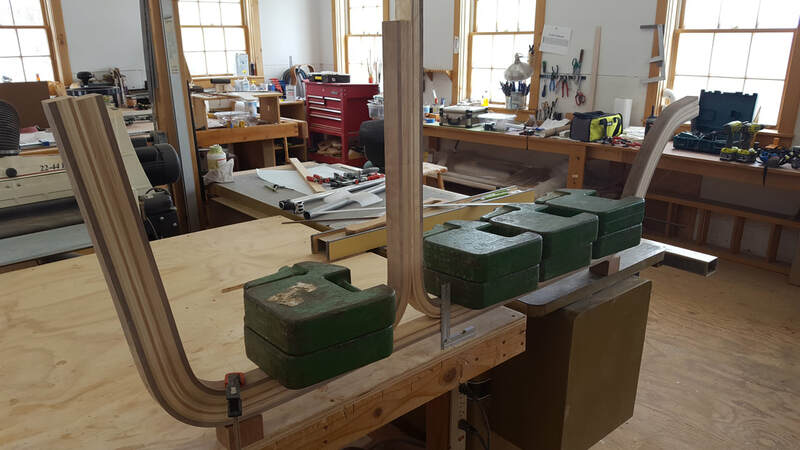 The beam will be 3x3 inches, routed out and rounded over once done. At this point, there is no carbon fiber reinforcement, but I will likely add some to the bottom bracket area later on. VBike will be keeping tabs on this project and we'll be back with more as Ward's amazing project develops! 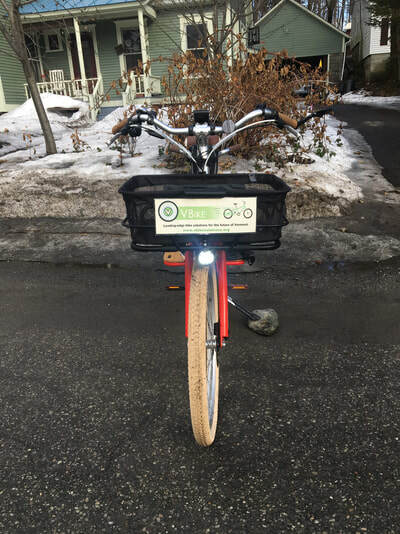 Vermont Electric Bike Report & Why VBike is So Worked Up! ​After a bit of waiting and some suspense, the Vermont Electric Bike Report is here. 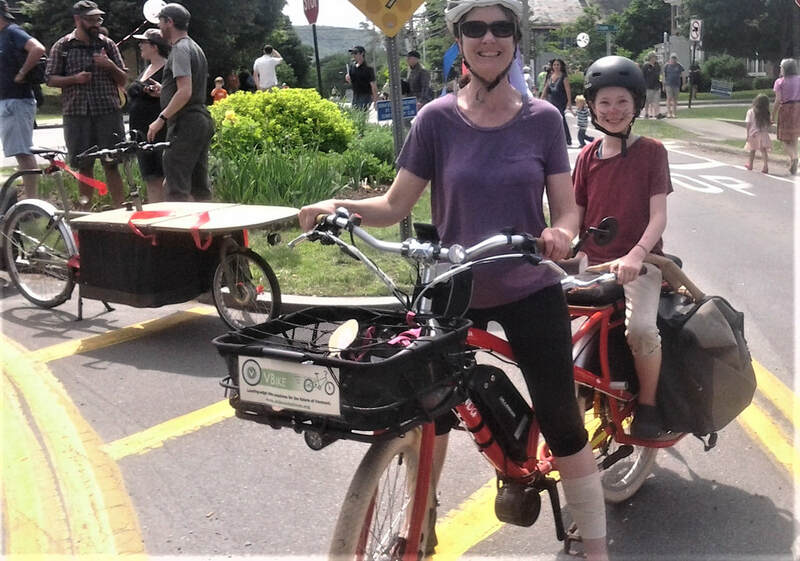 Generated by a nicely crafted online survey that VBike helped with and disseminated in 2017, this report is an exciting snapshot of what we at VBike consider to be an early stage of an e-bike revolution in Vermont. 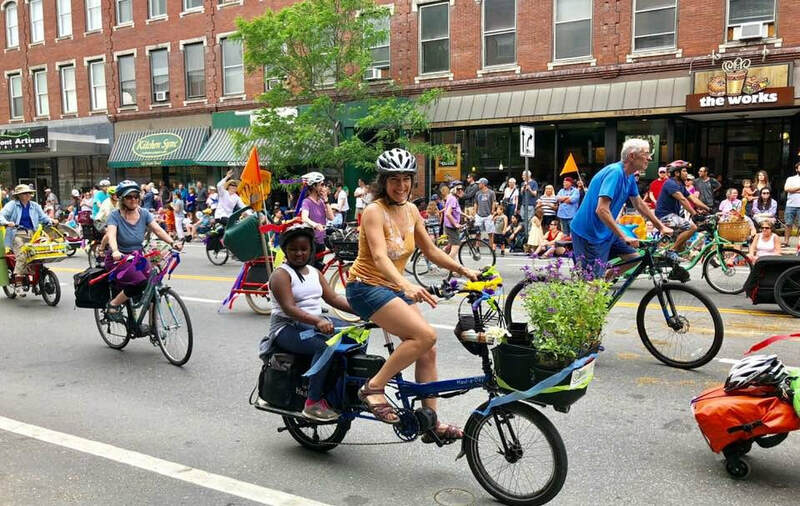 The findings are impressive and we firmly believe that as this phenomenon develops, bringing a fun, socially connected and ecologically sane form of mobility to our state, that it will have a profound impact on how we look at our communities and the infrastructure we build. It's already happening and so we're sticking the plan!! While the VT E-Bike Report is really important, we hope you'll bare with us here for a bit as we place our work and the report in greater context... You probably already know (namely because we've mentioned this a few times before) that VBike is so much more than about "bikes." Our big question continues to revolve around how we can live and move around on this beautiful, yet radically endangered planet and be far more in tune and aligned with the places and locales we inhabit. And so our work has a lot less to do with paying allegiance to any particular technology, but more towards solutions that can generally help us to be more connected to the world as well as to our own selves. 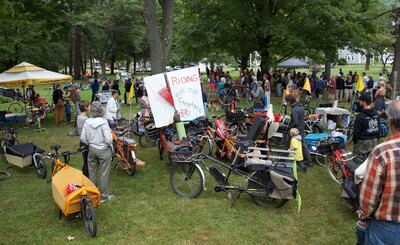 VBike promotes electric bikes, electric cargo bikes and other hybrid human/electric powered vehicles (and walking and biking in general) not because we are a "bike organization", but because we are an organization that is deeply concerned about how the unbridled and indiscriminate application of the automobile is eroding the world. We certainly believe that the automobile has its place and in no way are we saying that it has to go. That would be foolish (especially in Vermont), but we do completely challenge the unchecked and eccentric use of it and how it is applied. Furthermore, we take a firm stance on how absurdly normal it has become to undermine of our communities, landscapes, soundscapes, biosphere and all the species with whom we share this planet. We also shed our light on how "automobilism" is driving us to disengage from our own bodies, senses and emotional attachment to the human and more-than-human world. And now, with the coming invasion of the "self-driving carbots", we feel that it is imperative that there is an organization that can demonstrate ways we can transport and organize ourselves on this terrain we inhabit that makes sense and that has a vision of what a human-scale community looks like. We're completely cognizant that we are up against a profoundly deep colonization and ideological trance perpetuated on us by car companies and fossil fuel execs and now purveyors of artificial intelligence and so many others. They feed off of us. Look around you and witness it nearly everywhere on our land, in the air, when you step out the door, what you hear. Notice it in the media and advertising, what our infrastructure tells (our perhaps screams at) us what to do and how it's shaping us all physically and mentally. These corporate and technological entities are tirelessly at work enlisting us to violate our own world and communities, while we desecrate our atmosphere and throw our climate into chaos. And all this while we abandon our bodies, deny much of our relationship to the Earth, and cloud our potential for a deeper inner and outer sense of who we actually are. What's the endgame? 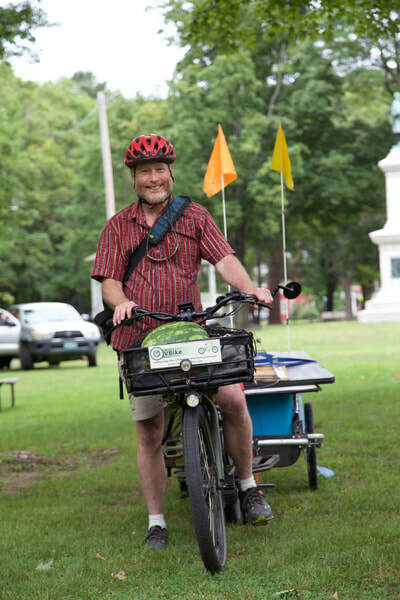 See the full Vermont E-Bike Report by clicking here. Crack open the report and you'll see for yourself that folks are predominantly using their bikes for commuting and errands. That means a lot of automobile miles being displaced by bikes which also translates into people using their bodies and actually functioning in the real social and ecological world. 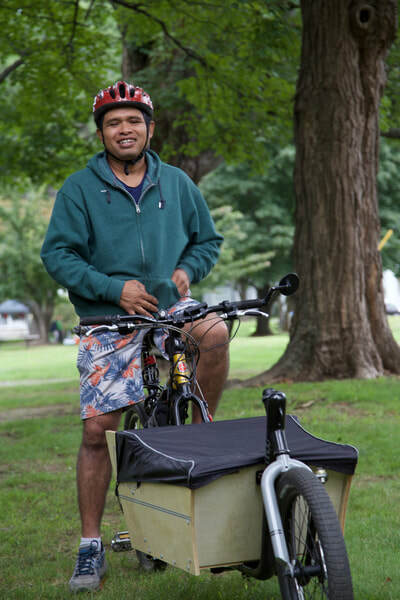 And among other things of interest in the report, it's great to see e-cargo bikes getting named and understood for what they can do for families and households. ​For those of you interested in how the project got started, here's the story...Back in late 2016 VBike was contacted by Nicole Carpenter of the Vermont Energy Investment Corporation about the idea of conducting an electric bike survey in Vermont. We thought it was a great idea and encouraged them to move on it. 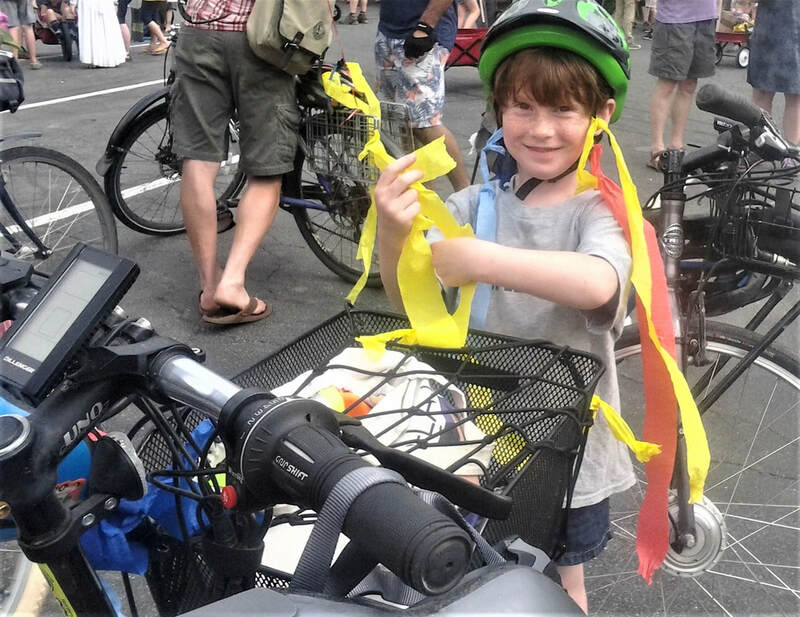 VBike provided assistance with the development of the survey and then reached out to our greater community in the state to as many folks as possible to participate. Towards the middle of last year Nicole got a great gig to go off to South America and left the project in the hands of Tom McCarrran. We think that Tom did a great job and he has made a point that we should all recognize that this project would not have been possible without the generous support of Efficiency Vermont and Burlington Electric Department. Thanks y'all. Tell us what you think about the Report and anything else you read here. Let's get thinking & feeling, doing, decolonizing our bodies and common sense and get more connected to this great world and state we share together. Now that's so much better. At this price, our customized Boda Boda is a better deal than any stock e-cargo bike you can purchase given all the accessories and great features we are including. This bike in like new, has about 300 miles on it and can climb virtually any hill, even with kids on board. We'll even include a set of lightly used, top-notch Schwalbe studded tires (worth $150) for winter riding! This electric Boda Boda is part of fleet of bikes owned and maintained by VBike, a non-profit bike advocacy organization in Vermont. Check out www.vbikesolutions.org. We sadly need to let go of the bike to cover some of the expenses we have incurred from developing our bike fleet. Email us at info@vbikesolutions.org if you are interested. 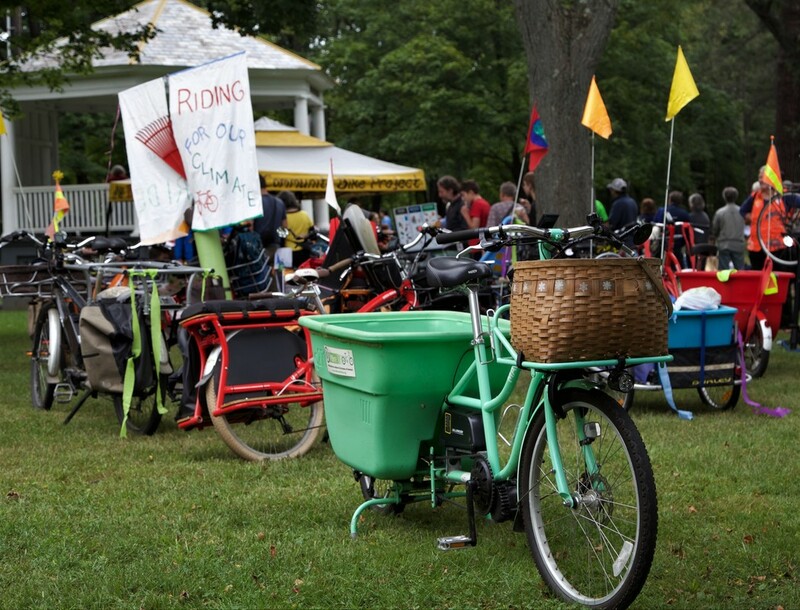 All proceeds go to VBike and our effort to "reboot the bike" in Vermont!